Clogged sewer pipe? Call us any time at A1 Sewer & Drain Services for sewer cleaning and sewer repairs, at 201-645-0888. Clogged sewer lines are a surprisingly common problem in Bergen County, Morris County, and elsewhere in north NJ. Like other household drains and plumbing pipes, your sewer main line can clog up with scale, grease, or debris, causing wastewater to back up through your drains since it has nowhere else to go. Although sewer clogs build up slowly over time, they can reach a breaking point quickly, resulting in backed up drains that seem to have come out of nowhere. This often leaves homeowners confused, although many sewer clogs are preventable with better sewer maintenance habits. At A1 Sewer & Drain Services, we provide residential and commercial sewer cleaning and sewer repairs to help you deal with clogged sewer lines and sewer backflow. We’re always available for 24 hour emergency service. Call us any time at 201-645-0888. Sewer pipes can clog up from any materials that get caught or build up inside the pipes. As sewer pipes get increasingly clogged, less and less water and solid waste can successfully pass through the pipes. Eventually, the problem gets bad enough that little, if any, water can escape. At this point, the only way to remove the debris is with hydro jetting from an experienced NJ sewer plumber. Grease and sludge. Along with kitchen grease, greasy components of solid waste can build up inside sewer pipes, eventually clogging them. Paper towels. Paper towels are designed to hold as much water as possible without breaking apart. Because they don’t break down as quickly as toilet paper, they can clog drain pipes and sewer lines. Feminine products. Many women flush certain feminine products, but you really shouldn’t. The absorbent cotton can hold a lot of water, and they don’t break down easily in water. Tree roots. Tree roots love to grow inside of sewer pipes, and because that environment is rich in moisture and nutrients, they can grow and expand very quickly. Tree roots can be removed with hydro jetting, but you may also need sewer repairs for the cracks and holes that allowed them to enter in the first place. “Flushable” wipes. Many baby wipes and similar products are advertised as “flushable,” but most NJ plumbers would disagree. Sand and sediment. If there are cracks or holes in your sewer pipe, sand and soil from outside can get into the pipe, potentially causing a clog. When you have a clogged sewer main line, you’ll notice problems with all of your drains and plumbing fixtures. Toilets won’t flush correctly, drains will empty slowly, and you may be able to smell sewer gases near drain openings. 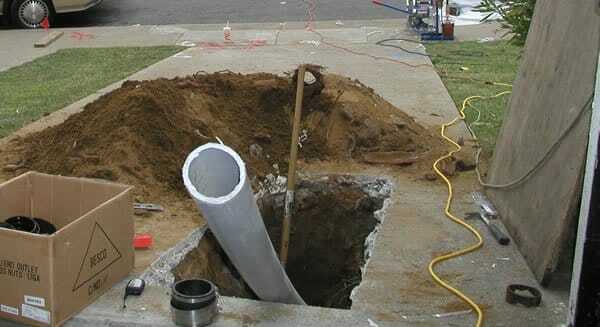 These are warning signs that you probably have a clogged sewer main line, and you should call a NJ sewer plumber as soon as possible for sewer cleaning service with hydro jetting. One of the biggest mistakes that NJ homeowners make is flushing paper towels, baby wipes, feminine products, and other things that don’t break down easily in water. Toilet paper is designed to break down as quickly as possible, while most other paper and cotton hygiene products are designed to do the opposite: hold as much liquid as possible without falling apart. This makes them great for cleaning and hygiene, but bad for the sewer pipes. Although sewer backups can happen because tree roots, scale, or corrosion have damaged the pipes, most cases that we see are caused by flushing the wrong things. Watching what you flush can go a long way toward protecting your sewer pipes from clogging up. Many NJ sewer plumbers recommend annual sewer cleaning and sewer camera inspection. This helps remove any debris that may have built up inside the sewer pipe, and also allows us to check the inside of the pipe for damage that might require sewer repairs. 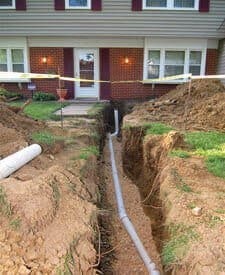 Annual sewer maintenance from professional NJ plumbers can catch problems early, before they cause your sewer pipe to back up. And beyond… so call us for time now!